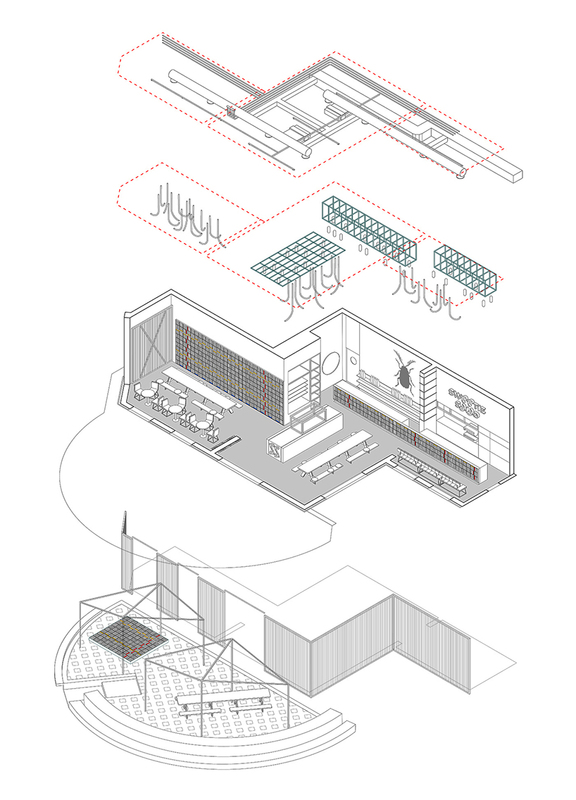 studio ramoprimo was founded in 2008 by italian architects marcella campa and stefano avesani. 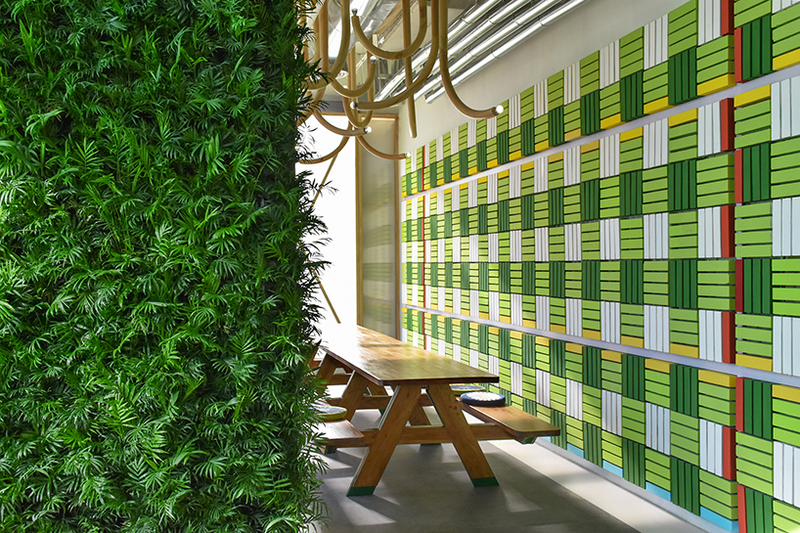 the beijing based architectural practice works across a range of projects including architecture, urban planning, interior design and graphics. 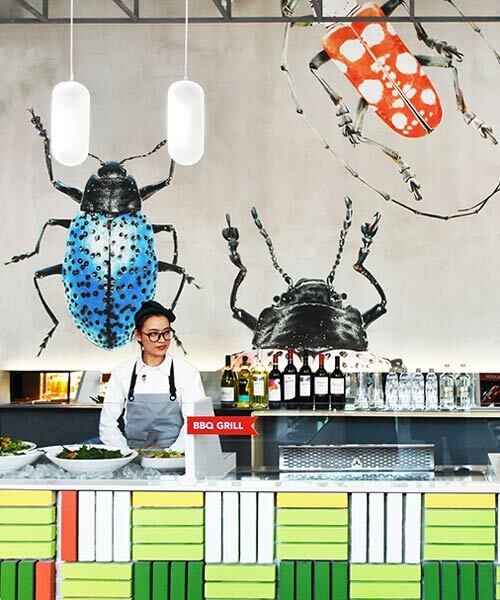 beijing-based studio RAMOPRIMO founded by italian architects marcella campa and stefano avesani decorated ‘sweetie salad’ restaurant with huge bugs and other images of nature. 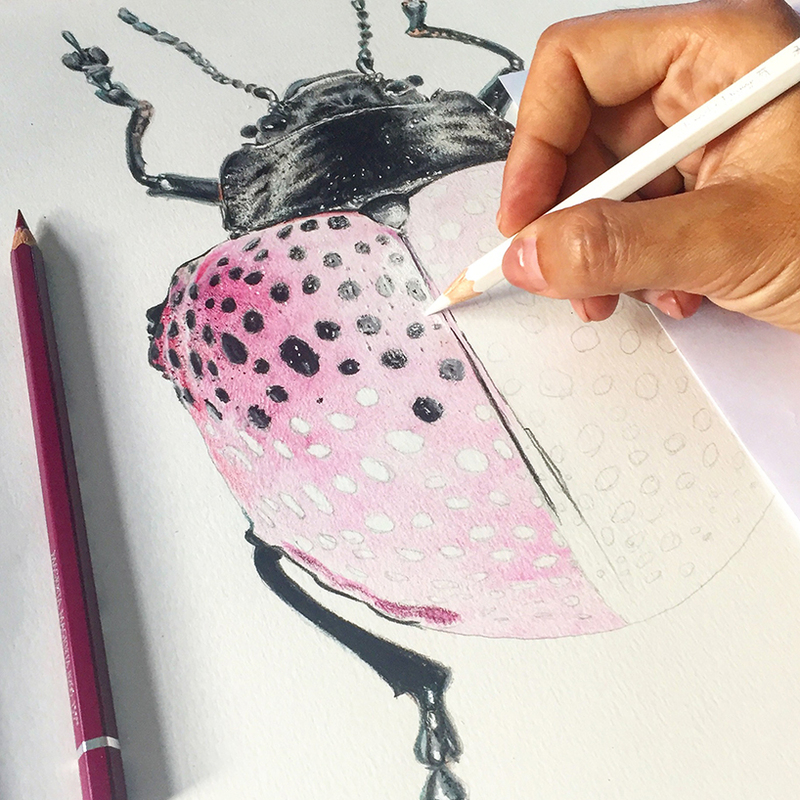 the concept is based on the idea of a picnic trip, where all typical elements of nature have been revisited, recombined and re-proposed into new roles. 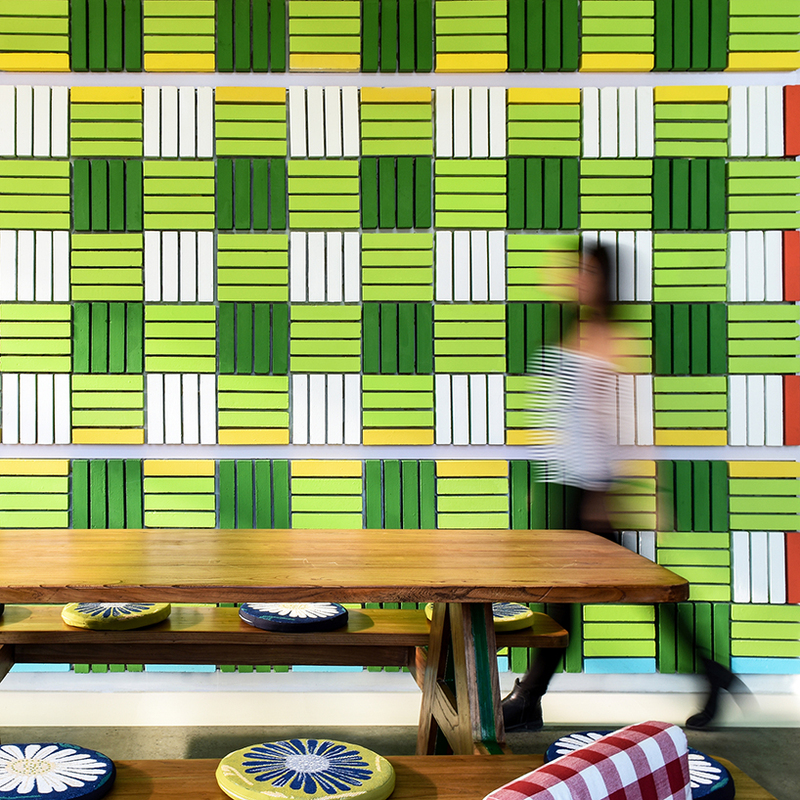 wall surfaces made of real clay bricks have been installed and colored like an enlarged gingham-patterned cover. 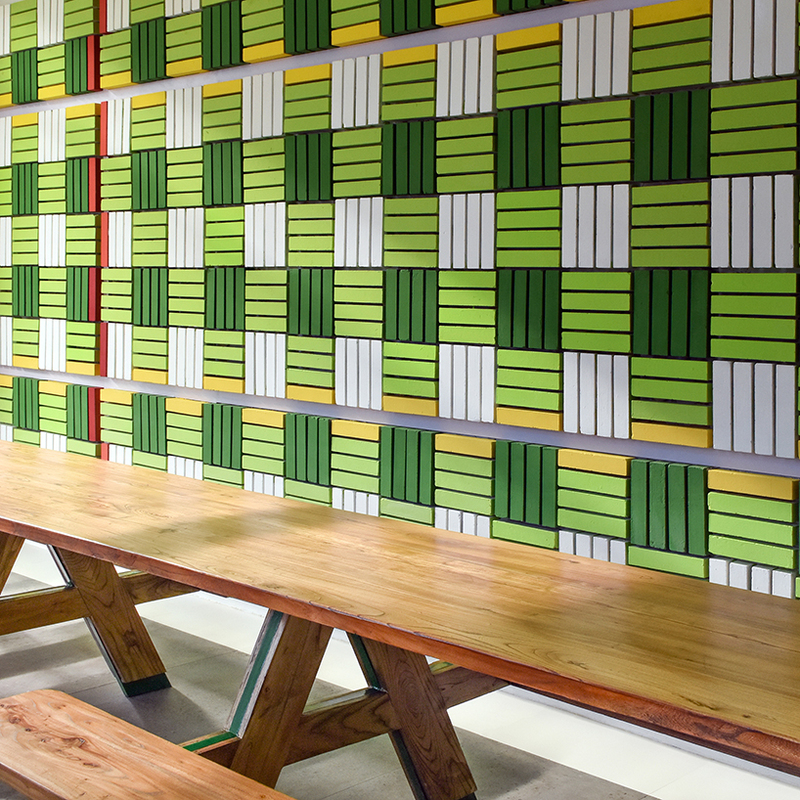 in the main dining areas, customers sit around over-sized community tables made of solid wood or on custom-made gingham-patterned chairs. 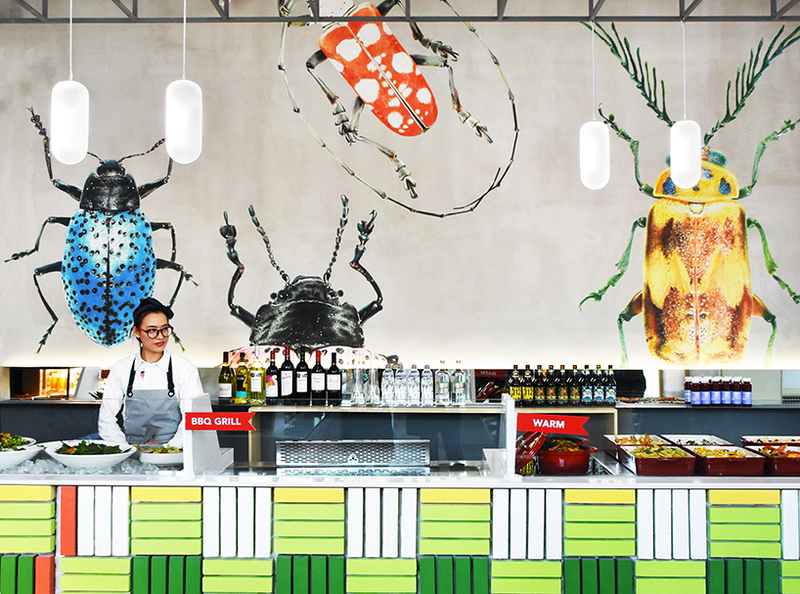 a vertical green wall welcomes the visitors at the entrance and leads them to the patterned counter standing out of a concrete wall covered with gigantic beetles climbing all around. 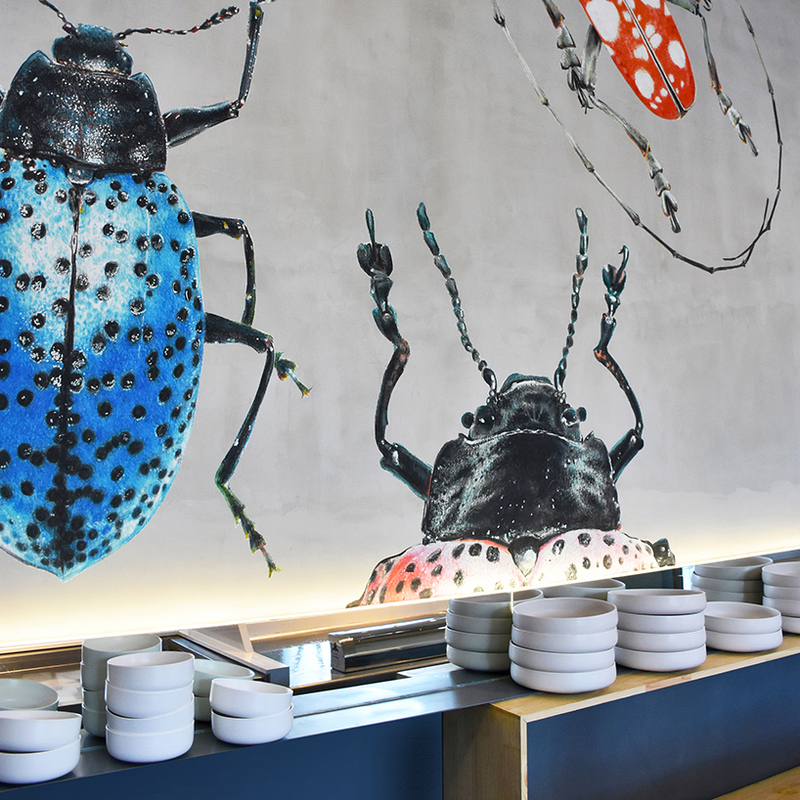 the insects are painted by the designers of RAMOPRIMO to add a splash of street art into the interior. 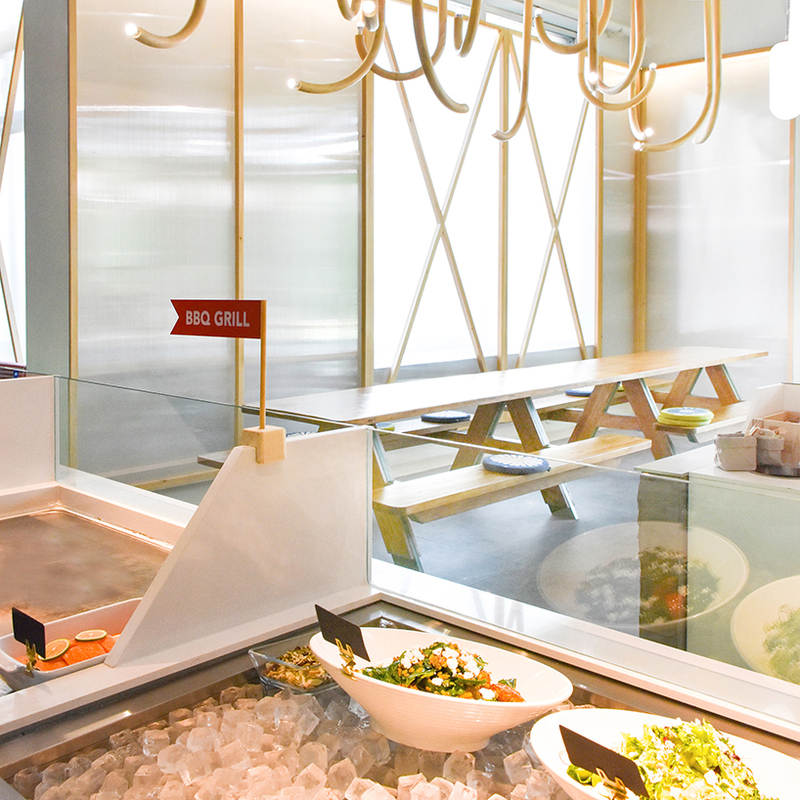 the lighting system, which is inspired by nature as well, is specifically designed and tailor-made for the restaurant. 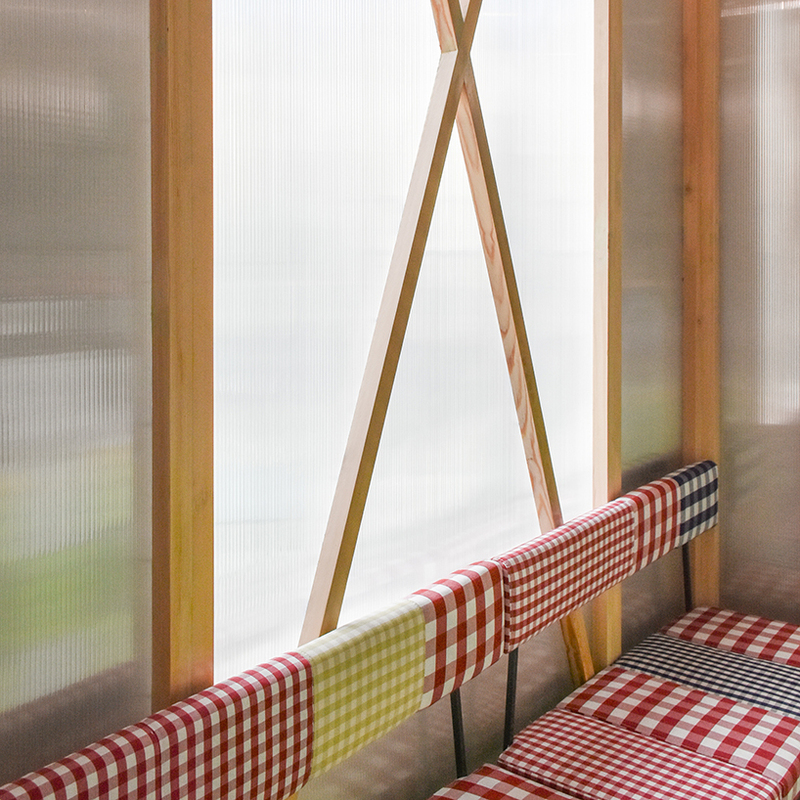 with the light on, the visitors are to imagine themselves dining under a tree with fireflies filling the air. 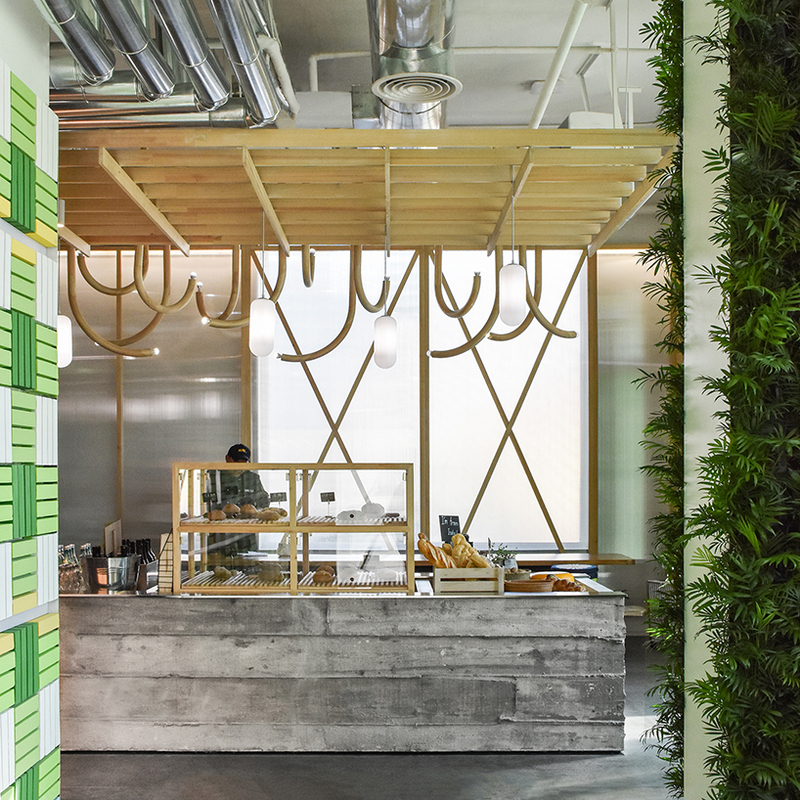 polycarbonate panels covering all external walls are fixed with wooden planks filtering natural light and giving customers a feeling of being in a bright naturally illuminated greenhouse. 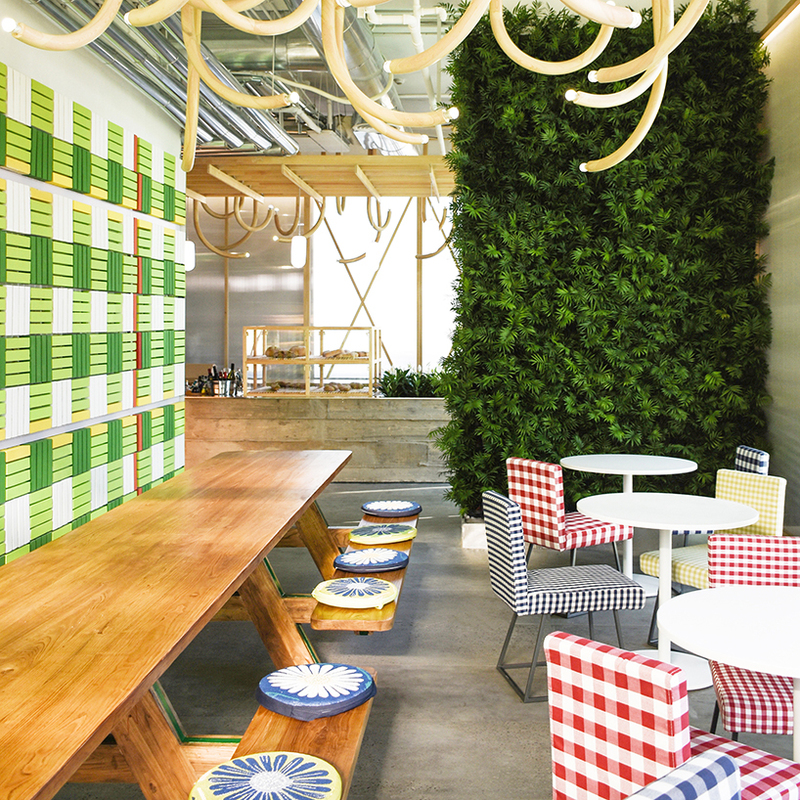 additional elements such as daisy flowers embroidered on seat cushions and graphic elements create a playful game of little details spreading around the space. 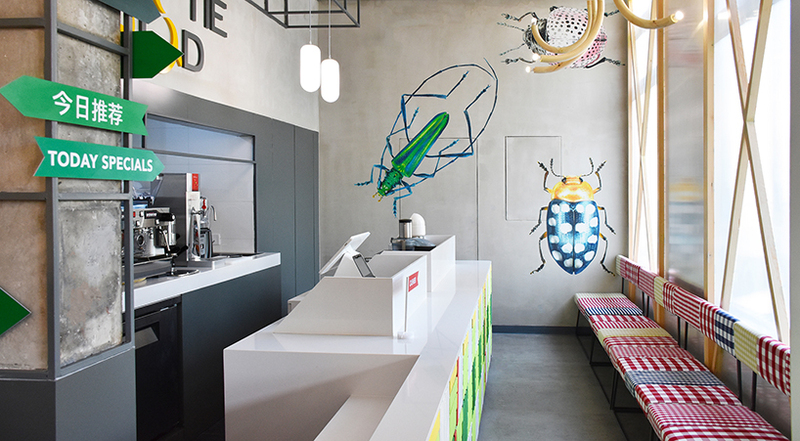 the menu is printed on flags with arrows that indicate main food directions like a cross-road signage in the countryside.